If you are looking for Art Lessons for your family, look no further. ArtAchieve is amazing not only in the way it teaches to draw, but also as a family bonding experience. Children of all ages enjoy spending time with parents and what can be more fun than learning to draw together. We completed Entire Level I and each lesson offered us an excuse to sit together at the dining room table, talk, laugh, draw, listen to music from around the world, and walk away feeling connected and each holding a piece of art we loved. ArtAchieve is the perfect combination of a fun activity, hands-on instructions, and beautiful art. 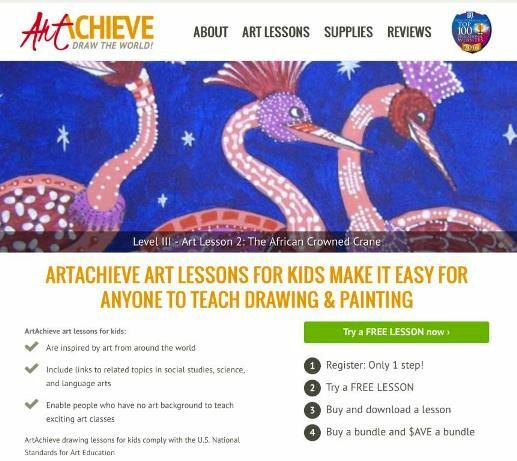 ArtAchieve is an award-winning website that offers online art lessons for kids and for the whole family. It was developed by John Hofland, a homeschooling dad and an art teacher. After designing an universtiy drawing course he was approached by elementary and middle school teachers asking him to adopt his method of teaching to suit younger kids and this is how ArtAchieve was born. At the heart of ArtAchieve is a believe that knowing how to draw is a learnable skill. John Hofland’s extensive work abroad (i.e. designing scenery in puppet theaters in Ukraine) had a strong influence on his teaching. In ArtAchieve you will find that most of the lessons are based on actual pieces of art from different countries around the world: from Czech Cat to the Owl from Bali, from German Nutcracker to Chinese Dragon. Each lesson starts with an information about the lesson’s subject matter, so besides learning how to draw children learn about the world. For the purpose of the review I was given access to Entire Level I bundle. I will walk you through one of the lessons in this level. Each lesson in Level I has four parts: warm up, power point slide show, video lesson and the copy of the final drawing that can be printed for reference. Before you begin the lesson you need to print out the warm up and perhaps the final drawing; and gather drawing materials (printing or construction paper and the medium of expression (markers, pencils, paints, pastels, etc). That’s all for the preparations! Now sit in a comfortable, bright spot with your laptop and select video lesson or power point slide show. We tried both and they are equally good. The narrator starts with a background information about the art piece, which is presented in a nice, clear format that appeals to kids (and adults). For example in a lesson on Chinese Dragons, we learned what significance dragons have in Chinese culture, why they are represented the way they are, and looked at some examples of Chinese dragons from Chinese restaurants and museums. My kids found it fascinating. I loved that the kids are drawn into participation by questions. My kids were very eager to share their opinions. After a brief relaxation exercise and a drawing warmup (in which students are asked to draw lines and curves), the drawing instructions begin. ArtAchieve manages to teach the basic design principles and drawing skills, while encouraging independence and unique world view. Students are constantly encouraged to make their own decisions, What kind of a dragon are you drawing? What is the shape of your dragon? So, how do you want to draw the wave of the dragon’s back? Kids feel safe to experiment secure in the knowledge that their final product is going to be satisfactory. Geography, literature, science, writing,… there are lots of ideas on how to extend the lesson and link it to other subjects. The book suggestions were always exciting and the science projects inspired enthusiasm. We drew together and it was a great bonding experience. The lesson consisted of us all sitting around dining room table and drawing together using the video lesson. My 8-year old is old enough to follow all the instructions along with me. My 5-year old is a bit too young for some of the lessons, but she enjoyed drawing the Czech cat (lesson 2) and The Hungarian Insects (lesson 3). When she felt frustrated by the lesson (Chinese dragon in lesson 6) because it was too difficult for her I gave her the print out of the final drawing and she was happy to color it. My 3-year old also just colored the printouts of drawings. Consequently, everybody walked away from the lesson proud of their work and making plans to meet for the next lesson soon. If it’s not clear yet, my whole family loves ArtAchieve. We went through all the lessons and all the artwork you see in this post was created by us! With ArtAchieve you can create beautiful art even if you think you have no particular talent. There is no preparation. It can be done by kids independently, but we really enjoyed doing it as a family. It’s fail proof and students do not feel frustrated. Still not sure, it’s for you? You can try it for FREE! The level of difficulty increase with each level, so if you try level 1 for free keep in mind that later levels are much more sophisticated. Here are a few more things I love about ArtAchieve. Focus on what matters. Where is the nose in the relation to eyes? Where is the tip of the tail? How can we make an object stand out against a dark background? The instructions focus on observational skills, specific technical skills and a whole lot of creativity that will benefit students in any kind of artistic (or business) projects in the future. Variety of mediums of expression. I loved that we got to try many different mediums: markers, pencils, pastels and acrylic paints. This is the first time we tried white pastel on a black construction paper and we loved it so much that we decided to create a gallery for our stairway. “There are no mistakes,” encourages the instructor, “if you draw a line you don’t like it, just draw another line that you do like.” This revelation caused a paradigmal shift in my 8-year old’s world view. He always liked to draw but some projects were left unfinished because it wasn’t coming out the way he imagined in his mind. When he heard the instructor insisting repeatedly that “you can not decide, if you like your drawing until you are finished” he started to believe it. Take a deep breath. We all know that relaxation exercises improve concentration and increase blood flow to muscles, but how often do you take time to do it for you or with your kids? I loved that each lesson started with simple relaxation techniques. My kids followed the instructions and enjoyed them so much that they repeated them multiple times each day. Gradual progression. Each lesson builds on the one before it. If you start in the beginning and advance regularly, before you know it, you are going to be studying Kandinsky and Color Mixing and The Da Vinci Clock. Other Schoolhouse Review Team members are reviewing this product. You might want to learn more about their experience with other levels of difficulty. Just click on the pic above. Hey Buddy!, I found this information for you: "Art Lessons for Kids (ArtAchieve Review)". Here is the website link: http://kidminds.org/art-lessons/. Thank you.